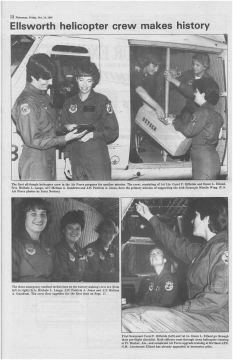 "FIRST ALL FEMALE USAF HELICOPTER FLIGHT CREW"
The first all-female helicopter crew in the Air Force flew together for the first time on September 17, 1985. The crew, consisting of 1st Lt. Dawn L. Eiland (AC), 1st Lt. Carol F. Kilbride (P), Sr. Amn. Michele L. Lange (MT), A1C Melissa A. Gundrum (MT) and A1C Patricia A. Jones (MT), have the primary mission of supporting the 44th Strategic Missile Wing. HELICOPTER FLIGHT CREW IN A DECADE"
Capt. Abbe Warren, pilot; and Capt. Katy Tenpenny, co-pilot. The first all-female helicopter crew in nearly 10 years took to the skies June 21, 2010, in their UH-1N, for a training mission in the Little Belt Mountains. 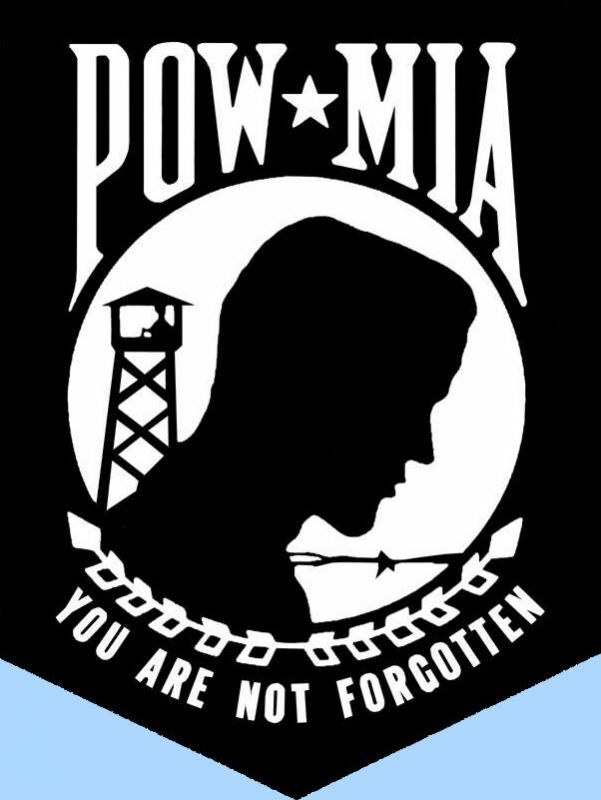 6/24/2010 - MALMSTROM AIR FORCE BASE, Mont. 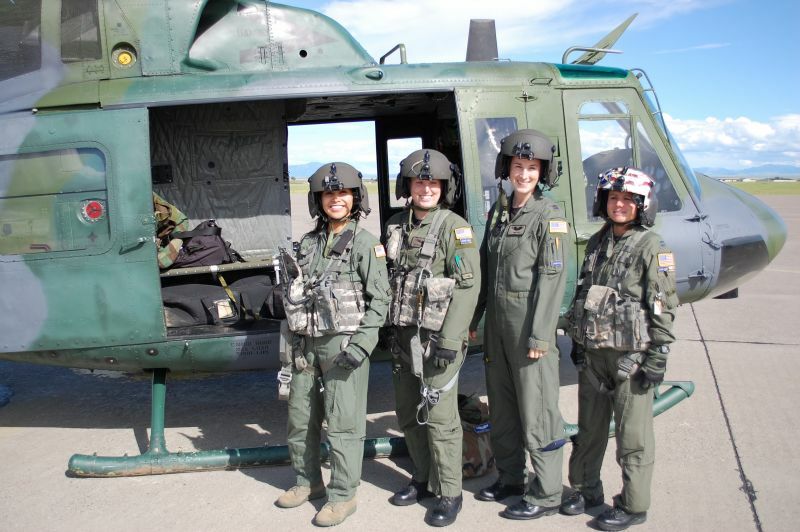 -- Another piece of Wing One history was made Monday when the first all-female helicopter crew in nearly 10 years took to the skies on a training mission in the Little Belt Mountains. While several female pilots have come and gone over the years the 40th Helicopter Squadron has been part of the 341st Missile Wing, there's never been a female flight engineer to call Malmstrom her home. That's because they are a rarity. Staff Sgt. Michelle Bresson is one of only two female UH-1N flight engineers currently in the active-duty Air Force. So when Capts. Abbe Warren and Katy Tenpenny found out Sergeant Bresson was headed this way, they started putting the wheels in motion to make the historic flight happen. "It's been something we wanted to do just because of the fact that it is kind of unique," Captain Tenpenny said. "It's very rare and kind of awesome, actually." Coordinating the flight took some time because Captain Warren recently had a baby and couldn't fly during the last trimester of her pregnancy. Sergeant Bresson only arrived six months ago and Captain Warren is also due for a permanent change of station move to Arizona next week. While the flight was somewhat of a unique opportunity, it was really just another day at the office for the three who participated. "This was a good opportunity, but it's really just business as usual for us," Captain Warren said. Sergeant Bresson echoed those sentiments. "It's a job and I do the best I can at it," she said. "These are two fully qualified pilots and I'm a fully qualified engineer. We are just out here doing a normal mission like any other crew would do." While the primary mission of the 40th Helicopter Squadron is security, their secondary mission is search and rescue. That is a mission that is called upon often by the local communities and remaining proficient in those talents requires training. Most calls for search and rescue also involve medical personnel - a flight surgeon and a medical technician. Along for the training was a fourth female, Senior Airman Malaya Movido. The mission Monday was to practice hoist capabilities - one form of rescue used by the squadron in helping them achieve their current record of 378 saves. "We're the only hoist-capable aircraft in the region so it just feels good when we're able to go out and help in the community," Captain Tenpenny said.